On account of coming back from Utah a day sooner than originally planned, we had all day on Sunday to make the trip home, and could have stopped short had we wished. Without time pressure, we were able to stop and look at some of the things we have previously wanted to explore but didn't have time on other trips. I know I originally wrote that the breakfast buffet at the Red Garter was okay. I have since downgraded it to "avoid" because Lisa was feeling sick much of the day we ate there and attributes it to their food preparation. (This was a contributing factor, but not the main one, toward our cutting the Utah portion of the trip short.) The beds in the hotel rooms, however, were among the best we've had, and we've stayed in lots of hotels. It was neither so hard that we felt like we were sleeping on plywood nor so soft that we would keep rolling into each other in the center of the bed in our sleep. So we recommend the hotel, but not their coffee shop, and on Sunday we ate breakfast at the Wendover Peppermill. We had breakfast in the coffee shop, as their buffet (and much of the west end of the building) is under renovation. We would have stopped to look at the small aviation museum at Wendover Field, but it's closed on Sunday. We did not go poking around the outdoor exhibits because it was raining, and it rained hard on us for quite a while today. 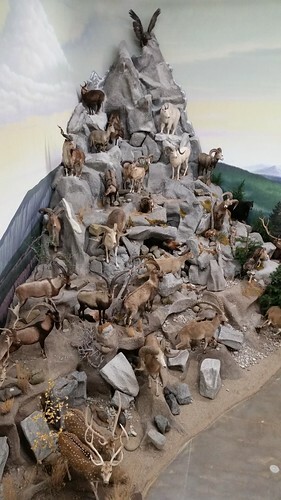 But it relented a bit at Elko, and a handout at the Red Lion Hotel/Casino tourist information rack reminded us of a museum we'd passed before. Today we finally had a look. 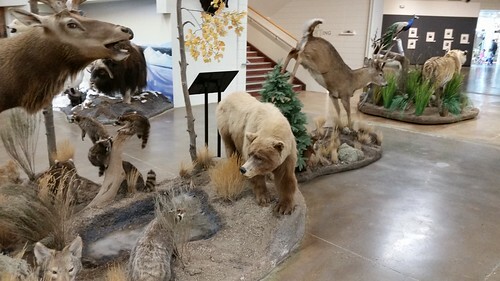 A significant portion of the Northeastern Nevada Museum is dedicated to the Wanamaker Wildlife Wing, of which this picture, taken from the upper floor art/photographic gallery, is just one portion. 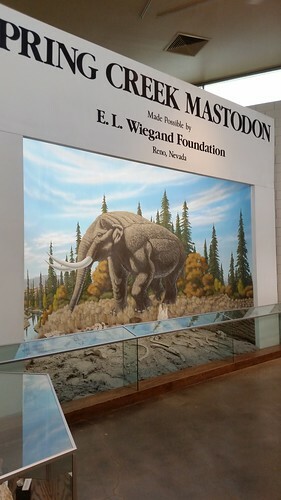 A very rare collection of 2 million-year-old mastodon bones discovered near Elko is on display here as well. 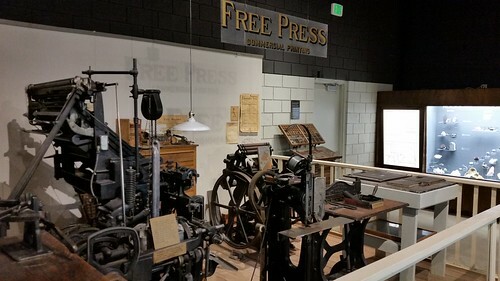 Another gallery is given over to local history, including a display of old printing equipment, an extensive collection of antique firearms, oddball things like some shoes meant to leave what looked like cattle tracks (used by a cattle rustler), and other quirky items like the denim tuxedo I mentioned above. The museum was well worth the $8 admission (for two) and the time we spent visiting it. We also picked up a book on the history of the Southern Pacific Railroad's Salt Lake Division (Sparks to Ogden), which covers where we live. I'm looking forward to reading this one very much. Lisa and I do not have happy memories of Wells, Nevada. Her van failed here once with two simultaneous flat tires, and on our trip to the Denver Worldcon, we had a flat tire here in Wells that led to $1800 in front-end repair work that my mechanic told me should have cost half as much for twice the quality. But we did stop for a railroad moment. This is the east end of the "directional running" on the former Western Pacific (left) and Southern Pacific (right). These two railroads operated single-track mainlines across Nevada. Between here and Winnemucca, they operated directionally, with both roads using both tracks one direction or the other. 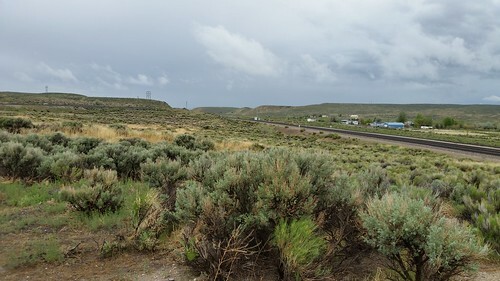 At this location heading east (the photo is taken facing west) the WP headed southeast for Silver Zone Pass and Salt Lake City, while the SP headed northeast for their crossing of the Great Salt Lake and Ogden. Leaving Elko, we pushed on to Winnemucca, where we stopped to have dinner at Winner's Casino. They once had signs all along the freeway touting their all-you-can-eat spaghetti dinner. The signs are gone, but the deal still remains, and it's a good one. Lisa and I had three helpings, and considered the meal good value. This is a good place to stop for a meal if your travel takes you through here. We had an option to stop here for the night, but Lisa (who actually drove the entire trip) said she was up to driving, so we kept going, and as I said yesterday, we got home about 10 PM. We originally had planned to stay home today, but had an offer from Cost Plus World Market that was worth going in to Reno to use. Normally we try to stay out of Reno on holidays, but this was the final day of the long weekend, and most of the out-of-town folks were already on their way home. We were hungry as well, so we went to the Peppermill Buffet. In fact, we were first in line in the "ordinary" line — Lisa pointed out that the manager actually escorted us in first to our usual table, bypassing the people who were in the "elite" line (mostly on coupon deals rather than because they were high rollers). Lisa tells me that the manager said she was happy to see regulars like us back again, because while they were very busy over the holiday, the customers mostly were unfamiliar with this buffet and tended to trip over each other a lot. Regulars like us know what's what and tend to be more efficient in our visits. Completing our dining and grocery shopping, we headed home. I didn't get everything done today that I'd planned to do. I hope I can get the Worldcon business done in the next few evenings after work.